Trndmrkr worked together with Psilogy on a research about The Ne (x)t Generation for the Vodafone Life Rhythm Knowledge Center. In our society, failure is hardly accepted. Setbacks, blunders and disappointments are completely kept out of the picture. CVs flaunt LinkedIn and enviable photos on Facebook, but missed promotions or disaster holidays are nowhere to be found. Only successes are celebrated. But most young 20-somethings believe that setbacks, including professional, often can be an unexpected source of inspiration. The idea is simple: innovations are only possible with people who dare to cross borders. And that risk should be respected, honored and not punished. This generation will not only cater to innovation whitin current management structures of organizations, but they will tackle the fundamental principles of the so-called successful society as well. They know failure leads to inspiration and are embracing it as ways to fully develop themselves: authentic, confident and successfully! This isn’t about what LeBron James has done, or hasn’t done. This is about the difference between the expectations others may have of him versus the expectations he has of himself. What should he do? Just do it! Fail Safe from KS12 on Vimeo. LOSER tackles the ‘successful society’ by showing how an unexpected setbacks can be inspiring. 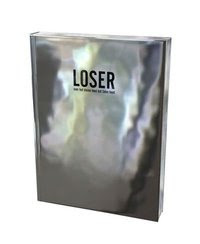 LOSER includes images, designs and works of over 60 creatives, including Erwin Olaf, Stefan Sagmeister, Silvia B., Atypyk, Tjep Hanna Hedman and their failure to present for entertainment, for inspiration, for identification or for processing. Loser will be launched November 15, contact for more info De Jonge Hond. click on the link below to access the ‘large’ poster format… and put it up somewhere for inspiration! All we ever wanted – trailer from 100% Halal on Vimeo. All we ever wanted is everything is a documentary on how young creatives are confronted with stress and handle performance-, peer- and social media pressure. Things most of us are confronted with every day… but can for some evolve in serious social and psychological problems. Later this month I will share some more examples of what keeps 20 something minds occupied nowadays and sum up on what effect it has on their decisions (= buying, career, psychology etc.) so be sure to check the blog regularly. new age fun with a vintage feel!